Art Clay Silver ON SALE ! What is Art Clay Silver & what's in it? When Art Clay Silver is taken out of the package, it is a slightly moist lump of clay (Image 1). The clay is composed of 1-20 micron sized silver particles, organic binders, and water . The clay is then molded into its desired cool shape, and dried. Once the clay is completely dry it can then be filed, carved, and sanded; after which it is fired with a gas stovetop, butane torch, or kiln. During the firing process, the organic binders burn away and the resulting silver particles "sinter", becoming denser and stronger (Image 2). The burning away of binders and sintering of metal causes the piece to shrink 8-10% in overall size while retaining the original form. Once completely fired, the remaining piece is composed of 99.9% pure silver. The new formula combines all the best features of each of the current formulas. 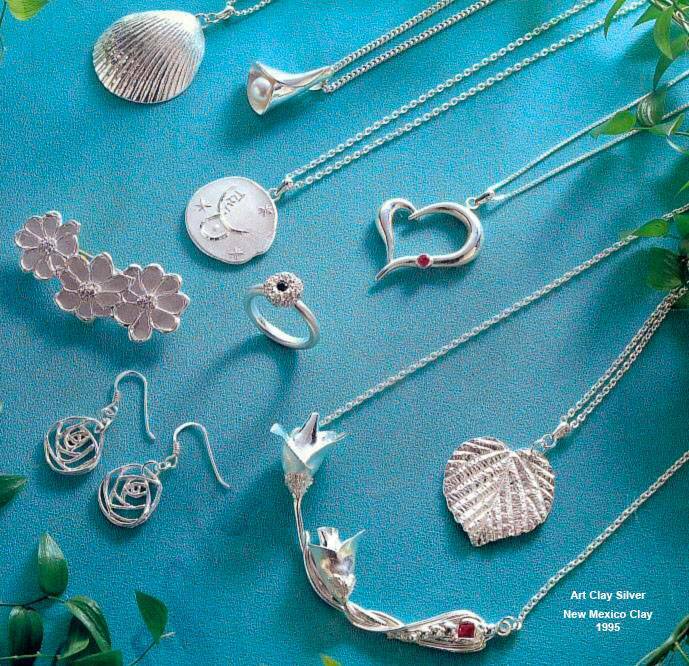 Art Clay Silver is still the only ACMI certified Silver Clay and is proven to be non-toxic.